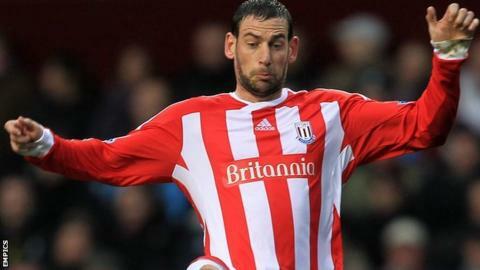 Stoke City midfielder Rory Delap is hopeful of turning his loan spell at Barnsley into a permanent deal. The 36-year-old made his debut in the win at Blackpool on Saturday after joining the Tykes until the end of the season on transfer deadline day. The former Republic of Ireland international has made just one appearance for the Potters this season. "I'd like to think if I do well enough then there'll be something for me here," he told BBC Radio Sheffield. "I'm out of contract in the summer and I want to keep playing, so I have to prove I can do a job over the next couple of months. "They've been flying since David (Flitcroft) took over and hopefully they can keep those results going and I'd like to be a part of that. "This is a great move for me at the moment because I was desperate to get away and play games." Delap has made 206 appearances for Stoke since joining from Sunderland in August 2007 and was part of the Potters side that gained promotion to the Premier League the following year. He was also in the team for the 2011 FA Cup final against Manchester City, which Stoke lost 1-0. Delap played 36 games last season, but his last appearance for Tony Pulis's side came in the 1-1 draw with Reading on the opening day of this term. "This has been the most frustrating six months of my life," he added. "It's been a shock to not be involved and it's probably been even worse for my family because I've been coming home from training with nothing to look forward to. "I've never been out of a team for more than a couple of games when I've been fit, but I couldn't have any complaints given the signings they've made there." The Reds, who are unbeaten in their last six games, travel to promotion-chasing Middlesbrough on Saturday.